A while ago, I saw the cutest socks on my friends son and asked my friend what he was wearing. She told me that they were socks made by Jazzy Toes and she got it as a baby gift when her son was born. I did my research and immediately fell in love. These socks come packaged in sets of six and look like miniature shoes. Styles for boys and girls are called Sneakers, Mary Janes, Deck Shoes, Spectators etc. and they even make a variety pack for both girls and boys for parents who cannot choose just one style (the boy's variety pack is pictured above)! They come in really nice packaging and make a great shower or baby gift. 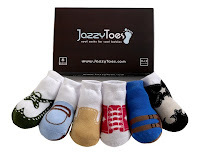 Socks come in two sizes-0-12 months and 12-24 months. What is great about these socks is that they are pretty true to size and run larger than some other brands so that the 0-12 months actually fits a 12 month old and is not outgrown by the time they are 6 months old. These socks are really, really worth checking out. Keep them in mind for the next baby present you have to buy!! !